OTTAWA - The president of the Native Women's Association of Canada will relinquish her post later this year as she seeks to run for the federal Liberals in the next election. 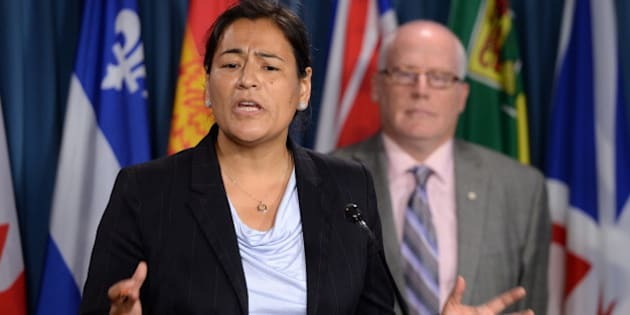 Michele Audette says the Liberals have given her the green light to seek the nomination in the Quebec riding of Manicouagan, which is now held by the NDP. She says her decision to run for the Liberal nomination won't put her organization into any more of a conflict with the Conservatives that it is already in. "The conflict was already there," Audette said Monday. She says she was told when she became president of the Native Women's Association of Canada that the organization's funding would be cut. "Day 1 that I was elected as the president ... (and) not knowing that I might jump into the federal election, not knowing at all, it wasn't in my plan those days, two years ago — the first news I got was, 'Michele, we will cut you,'" she recalled. "And then it never stopped." The Native Women's Association has been one of the loudest voices calling on the Conservative government to hold a national inquiry into murdered and missing aboriginal women and girls. The Conservatives have resisted calls for an inquiry, saying dozens of studies have already been done and now is the time for action. The government's latest budget included a five-year, $25-million renewal of money aimed at stopping violence against aboriginal women and girls. Kellie Leitch, the minister for the status of women, recently elaborated on how the money will be spent. — $1.4 million will be spent on sharing information and resources with communities and organizations and to report on progress and results. The government is also spending additional money on shelters and activities to prevent family violence, a DNA-based missing persons database and continuing support for police investigations through the National Centre for Missing Persons and Unidentified Remains and special RCMP project teams. Both Leitch and Aboriginal Affairs Minister Bernard Valcourt now say they are open to participating in a roundtable discussion about murdered and missing aboriginal women and girls. The idea for a roundtable came from a meeting last month between the premiers and aboriginal leaders in Charlottetown. The Conservatives initially resisted the idea, but now say they're open to such a discussion as long as it results in more than just talk. Audette says she wants Prime Minister Stephen Harper to lead the discussion. "We'll send the invitation to Prime Minister Harper," she said, "because I believe ... it's not only (the) status of women or justice minister who should lead this table. Now it's a matter of this prime minister needs to commit to this roundtable."